The changing nature and rapid growth of the investment management industry, along with new theoretical developments in the field of finance, have led to a need for higher quality investment management practices and better qualified professionals. The Theory and Practice of Investment Management recognizes these needs and addresses them with sharp, innovative insights from some of the most respected experts in the field of investment management. The Theory and Practice of Investment Management discusses and describes the full scope of investment products and strategies available in today's market. Led by financial experts Frank Fabozzi and Harry Markowitz, the contributors to this book are active, successful practitioners with hands-on expertise. By combining real-world financial knowledge with investment management theory, this book provides a complete analysis of all pertinent investment products-including hedge funds and private equity-and explores a wide range of investment strategies. Tying together theoretical advances in investment management with actual applications, this book gives readers an opportunity to use proven investment management techniques to protect and grow a portfolio under many different circumstances. FRANK J. FABOZZI, PhD, CFA, is Editor of the Journal of Portfolio Management and an Adjunct Professor of Finance at Yale University's School of Management. Dr. Fabozzi is on the board of directors of the Guardian Life family of funds and the BlackRock complex of funds. He is an Advisory Analyst for Global Asset Management (GAM) with responsibilities as Consulting Director for portfolio construction, risk control, and evaluation. HARRY M. MARKOWITZ, PhD, is a consultant in the finance area. In 1990, he shared the Nobel Prize in Economics for his work in portfolio theory. In 1989, he received the John von Neumann Award from the Operations Research Society of America for his work in portfolio theory and other applications of mathematics and computers to business practice. SECTION ONE: FOUNDATIONS OF INVESTMENT MANAGEMENT. Chapter 1. 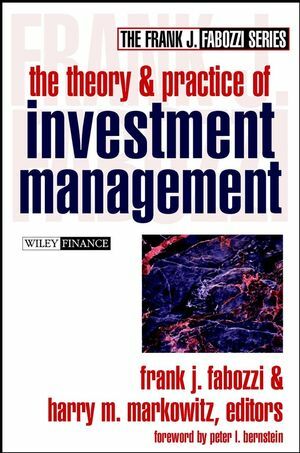 Investment Management (Frank J. Fabozzi and Harry M. Markowitz). Chapter 2. Portfolio Selection (Frank J. Fabozzi, et al.). Chapter 3. Applying Mean-Variance Analysis (Frank J. Fabozzi, et al.). Chapter 4. Asset Pricing Models (Frank J. Fabozzi). Chapter 5. Calculating Investment Returns (Bruce Feibel). SECTION TWO: INVESTING IN COMMON STOCK. Chapter 6. Common Stock Markets, Trading Arrangements, and Trading Costs (Frank J. Fabozzi, et al.). Chapter 7. Tracking Error and Common Stock Portfolio Management (Raman Vardharaj, et al.). Chapter 8. Common Stock Portfolio Management Strategies (Frank J. Fabozzi and James L. Grant). Chapter 9. Traditional Fundamental Analysis I: Sources of Information (Pamela P. Peterson and Frank J. Fabozzi). Chapter 10. Traditional Fundamental Analysis II: Financial Ratio Analysis (Pamela P. Peterson and Frank J. Fabozzi). Chapter 11. Traditional Fundamental Analysis III: Earnings Analysis, Cash Analysis, Dividends, and Dividend Discount Models (Pamela P. Peterson and Frank J. Fabozzi). Chapter 12. Security Analysis Using Value-Based Metrics (James A. Abate and James L. Grant). Chapter 13. Multi-Factor Equity Risk Models. Chapter 14. Equity Derivatives I: Features and Valuation (Bruce M. Collins and Frank J. Fabozzi). Chapter 15. Equity Derivatives II: Portfolio Management Applications (Bruce M. Collins and Frank J. Fabozzi). SECTION THREE: INVESTING IN FIXED-INCOME SECURITIES. Chapter 16. Fixed-Income Securities (Frank J. Fabozzi). Chapter 17. Real Estate-Backed Securities (Frank J. Fabozzi). Chapter 18. General Principles of Bond Valuation (Frank J. Fabozzi and Steven V. Mann). Chapter 19. Yield Measures and Forward Rates (Frank J. Fabozzi and Steven V. Mann). Chapter 20. Valuation of Bonds with Embedded Options (Frank J. Fabozzi and Steven V. Mann). Chapter 21. Measuring Interest Rate Risk (Frank J. Fabozzi and Steven V. Mann). Chapter 22. Fund-Income Portfolio Strategies (Frank J. Fabozzi). Chapter 23. Bond Portfolio Analysis Relative to a Benchmark (Lev Dynkin, et al.). Chapter 24. Multi-Factor Fixed-Income Risk Models and Their Applications (Lev Dynkin and Jay Hyman). Chapter 25. Fixed-Income Derivatives and Risk Control (Frank J. Fabozzi). SECTION FOUR: INVESTMENT COMPANIES AND EXCHANGE-TRADED FUNDS. Chapter 26. Investment Companies (Frank J. Jones and Frank J. Fabozzi). Chapter 27. Exchange-Traded Funds (Gary L. Gastineau). SECTION FIVE: INVESTING IN REAL ESTATE AND ALTERNATIVE INVESTMENTS. Chapter 28. Real Estate Investment (Susan Hudson-Wilson). Chapter 29. Hedge Funds (Mark J. P. Anson). Chapter 30. Private Equity (Mark J. P. Anson). Chapter 31. Active Asset Allocation (Robert D. Arnott). • Divided into six informtaion-packed sections: I. Foundations of Investment Management, II. Investing in Common Stock, III. Investing in Fixed Income Securities, IV. Investment Companies and Exchange-Traded Funds, V. Investing in Real Estate and Alternative Investments, VI: Asset Allocation.